The award-winning, New York-based Cabinet magazine has announced the opening of "WORK STUDIES IN SCHOOLS," an exhibition at their collaborative art space that draws on a series of video and photographic works from the Darcy Lange Estate "which examine the processes of teaching and learning." 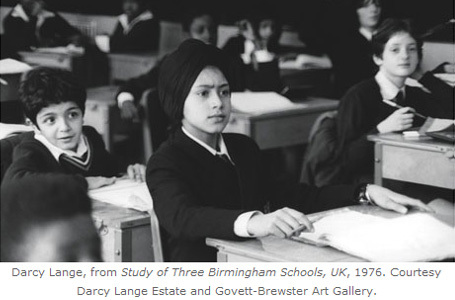 The works presented in "Darcy Lange: Work Studies in Schools" were part of a project that Lange began in 1976 by videotaping instruction on the teaching of art, history, and science at three different schools in the city of Birmingham, England. Conscious as to both the documentary and artistic nature of his project, Lange set up shop in schools with student populations that covered different classes of English society. After recording the instruction, Lange would then do separate playback viewings for both teachers and students, noting their different reactions. The "Work Studies in Schools" project was an extension of a larger socio-economic study, undertaken as a process within which to create art, which had begun a few years earlier. In 1972, under the general theme of "people at work," Lange began videotaping and filming people in their daily environments at English factories, mines, and schools. To increase his sample size and test variance, Lange continued the project begun in Birmingham the following year, recording classrooms at four institutions in Oxfordshire. Lange apparently saw his tapes as "research" material, and although much of the initial attention falls on the videos, for Lange the "educational process" documented in the project centers as much on the reactions of his subjects to the original films as the films themselves. Not to be confused with the Kawasaki Motocross Racing rider of the same name, this Darcy Lange was a New Zealand artist, born in 1946, who graduated from the Elam School of Fine Arts in Auckland and the Royal College of Art in London. Lange initially worked as a sculptor, but with rapidly advancing portable technology ultimately turned to photography, film, and video. Lange's work in British schools helped inform later projects upon returning to New Zealand in the late 1970s. One such endeavor was his ambitious Maori Land Project, which aimed to further the efforts of indigenous activists seeking to establish land rights in New Zealand from 1977-1981. Lange died in Auckland in 2005. The Cabinet gallery is open Tuesday to Saturday from 12-6pm, and the exhibition runs until January 16th 2010 at Cabinet's space in the Gowanus neighborhood of Brooklyn.